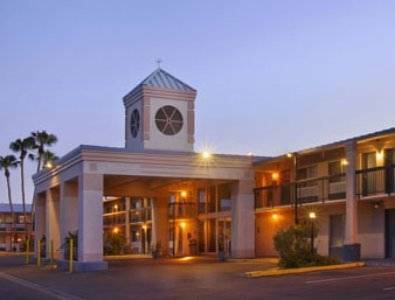 Book this Howard Johnson Inn Yuma for a fun-filled family vacation. Yuma International Airport is just one mile away, and the Southgate Mall across the street. This lodging is just a short drive from golfing, sporting events, Yuma Speedway Park, and an exciting night playing games or seeing performances at Cocopah Casino. Find hearty burgers and spicy wings at The Crossing Grill and Bar less than a mile from this lodging. Wake up to a complimentary Rise and Dine continental breakfast with hot items, and plan your exciting day with the complimentary wireless Internet access. Relax in the heated outdoor pool and hot tub, and refresh your wardrobe in the guest laundry. After your adventures, refresh in your comfortable guest room with microwave and refrigerator. Handicapped-accessible rooms are also available. Pets are welcome at this smoke-free lodging. Museum and crumbling remains of a historic desert jail. More colorful than modern tourist prison attractions, and much less terrifying. Huge, abandoned suspension bridge spans the desert. Hi Jolly was imported from the Middle East, along with a lot of camels, to cross the sandy wastes of the American Southwest.